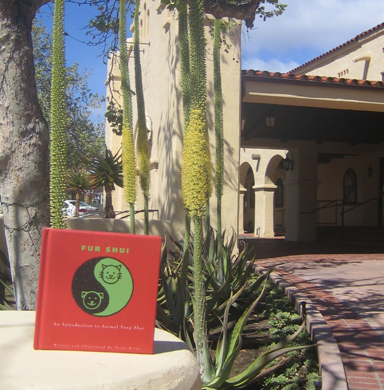 Fur Shui found itself visiting Ojai, CA again, can't get enough of that quaint valley and great vibe of Ojai! Traveling via car, bike and then resting at a spa, Fur Shui was part of the street scene. 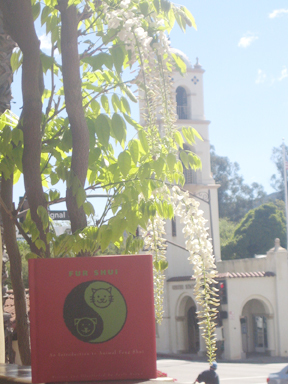 Ojai's main street has a clock tower with beautiful bells striking the hours out. Bells in Feng Shui and Fur Shui bring in or "announce" good fortune, wealth and prosperity. Get a bell and put it on your pet's collar to announce it to others (birds for one with your kitty! ), as well as attract some great energy to whatever you may need to bring into your life. Simply place the INTENT of what you want into the bell, bless both you and your fur folk and watch what you both attract. For great health, add a "gold" bell to a collar or leash!